I suppose it's impossible to meaningfully quantify, but the idea that a tiny 4mm square fragment which would later prove to be the entire crux of the case, would be found amoungst millions of pieces of debris over a 1000 square miles of countryside is pretty hard for me to believe. To clarify, it was larger, about 1cm sq, and was supposedly found within a larger scrap of shirt collar. It was the collar that was supposedly found and picked up. That makes it more plausible, if indeed the story is true. Nothing against Rolfe, but if there's any possibility of fakery, where we draw the lines is something to consider. I don't know the science involved, but just consider the arrangement - the main circuit board and MST-13 are about equally poorly spaced for survival. And the brown labeled side of this fragment was facing the blast. In contrast, the MST-13 was set in edgewise, and actually would stand a better chance of its face surviving. Mr.Claiden doesn't convince me terribly well either. He's independent of what? RARDE too is supposed to be independent of any frame-up plans someone hatches, but we can agree a couple of their people at least were not. So why not someone at AAIB? He's made other questionable calls, like for some reason deciding metal chunk AI/100 just had to be from right next to the bomb, with nothing but a hunch that seems to ignore physics. If having another agency's person makes a questionable fragment look less questionable, well, maybe that's why this unusual early find was found in such an unusual way. But that aside, let's call it another mystery. Sorry, Rolfe, if it makes your head hurt to consider it. You'll have to manage that yourself by just not going there anyway, I suppose. Well, I have an open mind. Mainly, it seems very implausible to me that there was any plan to subvert the direction of the enquiry which was so advanced so early that it knew exactly what it wanted to plant and was bold enough and organised enough to plant it. Particularly considering that most of the debris was still unexamined at that point, so they couldn't have known what they were really going to find. But at the same time, I agree the survival of that brown chip with its pristine white lettering is a bit of a facer. What I would propose would be to call a truce on Wyatt and agree to continue the discussion as if it's possible he made some sort of mistake, even if you don't believe he did. My reason for proposing this is that I don't think it's possible to persuade Bunntamas to agree that the survival of the MST-13 fragment was impossible. And that being the case, we'd be looking at a complete impasse. If Wyatt is right, that's the proof many people have been looking for that this highly suspect piece of evidence was indeed fabricated. It's proof the investigation was subverted and evidence planted to pervert the course of justice. It torpedoes the case against Megrahi completely, 100%, in one fell swoop. Bunntamas isn't going to wear it. He's going to imply Wyatt is a crook (though in my opinion he'd get on better by suggesting there was a methodological error in the blast tests). He's going to point out that we don't have a full set of results for these tests. He's going to point out that the results haven't been tested in court. He's going to point out that the SCCRC report explicitly said it found nothing to substantiate the suggestion that any piece of evidence had been substituted or fabricated. I'm certainly prepared to park Wyatt for now, as not proven, and at least await fuller and better details of the results if we get them. And frankly I think it's the only way we'll be able to continue to convese with Bunntamas. Longtabber s concept about how other suitcases weren't damaged was actually true. My dad was one of the "first fifteen" due to his interlining and "alleged" damage from the bomb to one of his suitcases. More than 15 years after the bombing we got the "questionable" suitcase back. It was in perfect condition, and the contents; textbooks and notebooks, clothing were all in tact, without one ounce char or of mud from the fields of Lockerbie. You'd never know it had been involved in a bombing or fallen 30,000 feet. Bunntamas, that's the first time you've told us it was your father you lost on Pan Am 103. Please let me say how very, very sorry I am for your loss. I've always felt very keenly for the victims of this atrocity, both on the plane and on the ground, and it really brings it home to be in contact with any of their loved ones. It sounds as if you think there was something not quite right about the condition of the case when you got it back? Not actually blast-damaged? Not damaged by the fall at terminal velocity? Would you mind explaining your take on that, because it sounds quite peculiar. I wouldn't have asked, but as you've volunteered the information, I hope you'll clarify it a bit. As soon as anyone can think of what else to say on the issue go for it. I'm a start a new thread. (though in my opinion he'd get on better by suggesting there was a methodological error in the blast tests). He's going to point out that we don't have a full set of results for these tests. He's going to point out that the results haven't been tested in court. He's going to point out that the SCCRC report explicitly said it found nothing to substantiate the suggestion that any piece of evidence had been substituted or fabricated. Thanks for thinking for me, but I need to dealve into this a bit further before I actually comment further, and make my own observations. Thanks for your kind words Rolfe. I sent you a PM in reply to other points. Well, I find Wyatt a bit difficult to swallow as things stand, too. If the work was published and peer-reviewed it would be different, but as it is we don't have the full methodology and results. Replication is important too, which given the expense and the shortage of people motivated to do the work (this isn't a cure for cancer he's discovered!) might be hard to come by. So I'd very much prefer to keep this parked unless and until we get better information and/or confirmation of his findings. I never implied that Wyatt was a "crook". I implied that his tests may have been biased. It's the same thing. You either approach these matters with rigorous impartiality, or you're no better than a crook. Don't get me wrong, I think (OK, I know) there are expert witnesses who are not playing a straight bat. However, that conclusion comes from taking note that this is what they're doing, by looking at their actions and track record. The assumption that every scientist or engineer employed as an expert witness may automatically be assumed to be bent is unsustainable. Sorry, I probably phrased that badly. Assuming you wouldn't be back for a few days, I was trying to explain to Caustic Logic, Buncrana et al. what your point of view would probably be, to induce them to see it from that angle. I am of the opinion, based on the evidence, that the MST-13 timer fragment was fabricated and planted in that shirt collar. For two reasons. First, the provenance of the item as a piece of evidence stinks to high heaven. It would actually be a miracle of biblical proportions if a piece of evidence with a pedigree like that was on the level. And second, because it doesn't make a blind bit of sense. If there had been an MST-13 timer in that bomb, the plane would have blown up five hours later than it did. However, theories have to bend to the reality, when that reality is established. What would the effect be of some sort of divine messenger showing up with conclusive proof that the fragment wasn't a plant? Not a lot, really, unless there was a great deal more information attached to it. Mainly, a great deal of puzzling as to why on earth the explosion happened at the time it did. The timer never pointed conclusively to any particular culprit, and certainly not to Megrahi. Accordingly, I don't have a problem continuing the discussion on the basis that we don't know for sure one way or the other. That's been the basic premise up till now anyway. Bunntamas, clear out your PMs! Sheesh, how do you get 150 PMs in a month and 48 posts? Are you having an affair with Shemp behind our backs? Last edited by Rolfe; 16th September 2010 at 06:04 PM. Hmmm. I just noticed that the journalist whose article prompted me to bump this old thread is the same person as wrote that intriguing article about "the Golfer" in 2008, and indeed the one that seems to be a lowdown on the PII document. I find myself in strange agreement with this guy in a number of important respects. If Wyatt is right, that's the proof many people have been looking for that this highly suspect piece of evidence was indeed fabricated. The devil is always in the details, and we don't have the details, until such time as independant explosives experts can pick over the fine details of his tests. Wyatts tests do open up more questions than they answer though. I do actually wonder sometimes how much it would cost to hire an explosives expert and carry out similar tests. Exactly what does happen to a radio packed inside a suitcase thats had 450g of semtex detonated inside it? Sigh. One of Caustic Logic's lines of speculation is that there might have been more than 450g, so that positioning in the hold would have been less critical. But if you go down that line, you're even more liable to vapourise everything in the suitcase. LOL! No, no affair w/ Shemp. Who is Shemp? Was that an inside JREF joke about which I am unaware? And did I just make a complete (bigger than current) fool of myself by asking that question? From what I can see, I don't / didn't have 150PMs. All I can see are the welcome message, one alert about being yellow tagged (bad Bunny, bad! ), and a couple of messages about posts (per yellow tag) being moved. Weird. I don't know the science involved, but just consider the arrangement - the main circuit board and MST-13 are about equally poorly spaced for survival. CL: where did you get that image? From the Claiden doc's? If so, was the blue "measurement" at the bottom included in the image you downloaded? Or did you add that? (no, I'm not accusing you of anything, I'm just asking about the source). It's the same image that was included in the booklet of evidence given to family members (and possibly others, I'm not sure about the latter) at the Zeist trial, with the exception of the measurement, which is not included in the trial booklet. Just curious. Last edited by Bunntamas; 21st September 2010 at 01:35 PM. Yes to the first part, no to the second. You may be far too fastidious to hang around in Community and find out what Shemp is reputed to get up to! Maybe the system only allows new members a few stored PMs? Normally one is allowed a total of 150, which includes anything the damn AutoModAction bot sends, and anything you've sent which has a copy saved in your "sent" folder. Anyway, the system was refusing to allow me to send you any more messages because you have "exceeded your quota of stored messages". Just delete anything you don't want, which would include all the automated messages if you've read them. People get posts moved and infractions all the time, it's nothing to worry about so long as you know what not to do again (see Charles, as the Awful Warning). A lot of these images are floating around the internet now. I have a feeling Edwin Bollier might be the original source of a lot of it, but once you let the files loose, they fly free. I don't trust Edwin as far as I could throw him (see your "Spanish typewriter" remark), but the images seem to be undoctored as far as I can tell. Some of them are indeed annotated though. The one of the mock-up of the IED is also included (in black and white) in Paul Foot's Flight from Justice booklet. Foot was of course the only journalist to sit through the entire Zeist trial, so he probably had the same booklet given to him as part of a press pack. Just by the way, you don't happen to have a copy of Production 930, do you? That's the passenger listing for KM180. There's some information on that I'd dearly love to confirm. The image was probably from a standard Google image search, I forget where. Buncrana provided me a better res version, but this one is already online. I added the blue for size ref. and did a little work to clarify the labels. On Bollier and images, I'm still baffled by the blueness of available JPEGs of MST-13 timers, most coming to us from Ebol the clown. Bunny, do you happen to have color photos from a separate source, and are they as blue as these, or different? BTW: I've been a member here for over three years but didn't get the Shemp thing either. But then I don't really "hang out" here much. correction re: above comment I'm surprise should be I'm surpised. Hayes said the chip was green when he first described it, whenever that actually was. And the chip photographed then is the same chip as the court exhibit. So why wouldn't it be green? But all the pics, including the reference items, are a weird bluish shade. I know what colour green circuit boards are, and that ain't it! While the pics of the brown Toshiba circuit board are the right colour. You can edit any typos in a post less than two hours old, if you want to spare your blushes. But who cares about the odd typo? Ha! SURPRISED. I am a really bad typist. Rolfe, who is definitely going to bed now. Thats a mock up showing a 'Trial Loading' - which basically means only the bomb maker actually knows how the explosive was packed into the bomb. They could have moulded the explosives and stuck them inside of the two speaker cones for all we know. 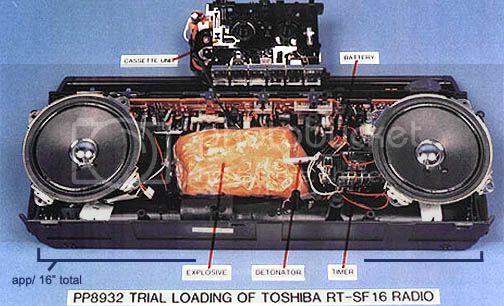 Perhaps the explosive was in a thin film smeared along the inside wall of the case, like the UTA-772 bomb was and the radio itself was a perfectly normal radio. We just don't know. All the forensic evidence is able to say is that bits of radio were found that were damaged by, and in close proximity to, the explosive device that downed PA-103. So why not someone at AAIB? He's made other questionable calls, like for some reason deciding metal chunk AI/100 just had to be from right next to the bomb, with nothing but a hunch that seems to ignore physics. I am not ready to throw Claiden out. He was one of a team of experts that worked on the AAIB report. Surely if there were mistakes in it they would have come to light already? Aside from Wyatt and John Parkes I don't know of anyone poking holes in the AAIB report. I don't believe Parkes, and so far Wyatt is short on details. And I'm not sure Wyatt is really doing that. If anything, he's just saying that stuff assumed (by RARDE, not the AAIB) to have been in the bomb suitcase couldn't have been and (by inference) is likely to have come from adjacent suitcases. The MST-13 fragment, which isn't something likely to have been in innocent luggage, is the only thing he's really putting severe pressure on. Last edited by Rolfe; 22nd September 2010 at 01:48 AM. I haven't gotten through my entire pile of stuff yet, but I’m doubtful that I have a copy of Production 930. Passenger manifests were kept very close to the vest. It took days for PanAm to release the manifest to families, while we waited in agony. 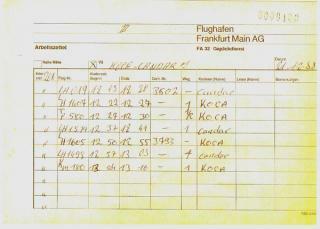 I do however have a copy of Production 1061 which is Frankfurt employees Koca and Candar’s worksheet records of coding of bags that were unloaded frrom KM180 into the baggage system for PA103A (below). Also, here is a section of the trial transcripts that contains info. on Production 1061, fragments found & where they were found in the hold & container & Dr. Douse’s test results indicating PETN and RDX, where the bomb detonated, etc. Seems relative to some of the comments / questions above re: debris & bomb placement, so I thought I'd post a quick reference. Last edited by Bunntamas; 22nd September 2010 at 12:38 PM. Oh, and BTW, the info. I referenced in the link above starts at around 9379. Thanks, that worksheet is one of the things that's been around on the internet for a while. I didn't realise the whole transcripts were on the internet, even if on Wayback. I had them by email. As I said, WordPerfect and I have just now created a single pdf file of the whole thing, minus the line numbers, single-spaced and with normal-length lines. It's very easy to read, completely searchable, and even retains the original page numbers for handy reference. The only little snagette is that it's 14Mb. If that's a problem, I also have it in a split version, seven files of about 2Mb each. Free to as many good homes as want it. Ambrosia: Indeed, and it could have been a different radio as well. But from what we were shown, or any arrangement sufficient to punture the fuselage, IMO the radio cant be counted on ti survive in but microscopic form. And I wouldn't toss Claiden's work or the report. There are a few question marks, and to me he doesn't have enough credibility to prove AG/145 true. I don't think anyone could do that for me once I saw how fake it was. Rolfe: Indeed. And don't forget Carl Davies. And Chris Protheroe, who WAS AAID, by extension (his 12"math suggest fakery of the container at least). In fact I rather appreciate the analysis they did on the container. I haven't tried understanding the plane failure in such detail, but that's probably legit and informative as well. Bunntamas: You know, the almost "Thomas" sound might be part of why I presumed you was a dude. But now you know I can be wrong at least once, and will be on the look-out for others, so I better stay sharp. That was an awesome post for having stuff in it. There are existing transcript links? I was led to believe unless you got a clandestine copy you had to pay 10,000 pounds for a print version. Caught in ignorance again so quick? Rolfe's hours of formatting ... no, this is still an improvement, plus condensing into 7 as opposed to 86 volumes. The Koca/Candar sheet is old news, though that scan looks different and very yellow. Will compare later, just in case there's any difference or clues. I'm still undecided if that's a 6 or a 0,and have decided it's not worth worrying about. I'd like to know what you think of that and what it says or doesn't say. Once I'd written the macro, each day took 2 to 5 minutes, but of that, less than a minute was actively doing anything. And there was no way I was going to be able to read it the way it was. Thanks. There used to be a password protected site for families during the trial where transcripts were posted daily. Alas, that site is now defunct, and the administrator sadly passed away. I was printing them at the start of the trial, but it became too cumbersome after the first couple of weeks. Now I wish I had them. But yes, that archives site is cool. The first appeal transcripts are also available there. Here's the link to the page with both trial and appeal. Mr. Taylor made a big deal at the trial regarding whether the finishing time for coding KM180 was 13.10 or 13.16. I go for 10, Ambrosia thinks it's 16, and to be honest I don't think anybody really thinks it matters. Indeed, the 1310/1316. Optically it's more a 6 but unsure, logically it should be a 0, factually this isn't the key document to be scrutinizing. I double-checked, and prod. 1061 is this paper, so it looks like we're getting into evidence for the bag from Malta. This would best be discussed either in that thread, or in the "Did ..." thread where it plays as central evidence. Don't forget it was a combination of prod.s 1060 and 1061 that suggested the relevance, and we'll be bringing up the problems with 1060 (Mrs. Erac' printout). I believe he was trying to correlate the accuracy of time between the clock at baggage loading, Koca and Cadar's watches (both of which were used to record loading times), what was recorded by hand, and the time on the baggage computer system. It's a difference of approx 2 to 10 minutes. That, and trying to show that the time window for coding that amount of luggage was wider than it should have been for what came off KM180. Assuming the 13.16 reading. He had a rather fantastical story about how half a wagon of luggage from Damascus, which he seemed to think was unaccounted for, might have been coded after the Luqa flight, and Koca forgot to make a separate note about that. That batch might have had luggage for PA103A (er, did it? I thought the Damascus passengers for PA103 interlined directly into Heathrow?). That would still have required Koca's watch to be off though, because 13.07 would still have been during the assumed Luqa coding time. And anyway, it seems that the Damascus luggage wasn't unaccounted for anyway. This was not Mr. Taylor's finest hour. There is a far simpler explanation. Or even maybe two. Am away till Monday and will pick up a few things when I get back. Just quickly though. We don't know how big the bomb was, where or how it was packed. The forensic evidence points that it was inside AVE4041 100% - no doubt in that at all. It points to on balance of probability it being inside a brown samsonite type case I'd guess about 85% likelyhood of that being the case. We also know that bits of radio circuit board were found blasted into bits of clothing. 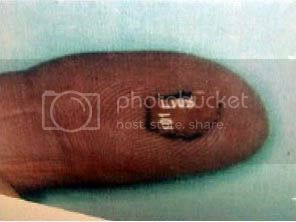 It's a pretty shaky conclusion to say that the clothe fragments/radio fragments were definitely from the bomb case imo. Having said that it can't be ruled out, the explosion was very complicated and chaotic who knows what tiny bits of stuff might have survived that really ought to have been dustified/vapourised. It's very difficult for us non-experts to know how much weight to put on a lot of that. As you say, the explosion was chaotic with stuff inevitably flying everywhere. The investigators made the basic assumption that if a piece of cloth had suitcase blasted into it, it was from outside the case, but if it had no suitcase blasted into it, it might have been inside the case. They also decided that the blue Babygro had been either wrapped round the radio or right up against it, and things with fibres of Babygro in them were given a high probability of being inside the case. As were things with bits of the radio components in them, but no bits of suitcase. I can see the logic of this. I have no idea how valid it is, but this was these guys' job. I imagine there were a lot of data gathered over many years of IRA mayhem, as well as Indian Head, to support the assumptions. On the whole, I'm inclined to go along with it in general, although obviously if more detailed experimental evidence shows it was unlikely to have been like that, it has to be re-evaluated. The Maltese clothes fragments existed, and Tony Gauci seems genuinely to have recalled selling the stuff to a tall dark stranger who has not been identified but certainly doesn't appear to have been a passenger on the plane, and hasn't come forward as having passed the things to a passenger on the plane. So if they weren't in the bomb suitcase, this is a lot stranger than anyone has ever postulated. Last edited by Rolfe; 23rd September 2010 at 02:40 AM. I think this might be the most appropriate thread for this. I have just seen John Wyatt on Newsnight, being challenged about his promotion of the bogus bomb detection device the ADE 651. The thing has been known to be classic snake-oil for quite some time. It's along the lines of the Vega-test or the Zapper or the Q-ray, or perhaps some of the audio devices like the CD "enhancers" - just a conglomeration of electronic bits that don't actually do anything. Seeing the demonstration of the device, it's comparable to a dowsing rod, in that it has a rod (an ordinary radio aerial) which will move either at the will of the operator or by ideomotor action. Ben Goldacre blogged about it over a year ago. http://www.badscience.net/2009/11/wtf/ However, it still seems to be in circulation - the common ploy of agreeing the original device was a fake but claiming that the new model is the real thing is well underway. I've seen this done with bogus allergy tests too. Anyway, Wyatt's performance on Newsnight led me to the rapid conclusion that the man is a fake and a charlatan. Which is something of a relief because as I said, his evidence really didn't fit with what we know about the Lockerbie explosion. He's right up there with Longtabber I'm afraid. I propose to ignore him totally, and my world-view has become considerably more coherent as a result. Last edited by Rolfe; 27th January 2011 at 03:59 PM. First Longtabber says the entire suitcase should have been vapourised, and then he turns out to be a complete fraud. Then Wyatt says the entire suitcase should have been vapourised, and then he turns out to be a complete fraud. I'm seeing a bit of a pattern here. Interesting. Two points is the base minimum level at which a pattern can be seen, right? Given his clear dishonesty in the ADE 651 issue, my conclusion is that he faked the Lockerbie tests. Bunntamas was right, though I think for all the wrong reasons. I think he knew or thought that the defence were hoping none of the timer circuit board would survive, and somehow fiddled the methodology or the data to get that to happen. I don't suppose he had any notion that announcing the entire suitcase was obliterated was inconsistent with the rest of the evidence found. Too bad. Busted.